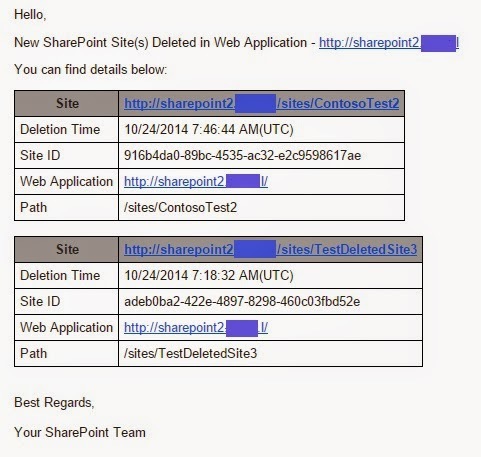 Couple of weeks ago I received a question from one of our customers if there is a way to get alert when a site collection from their SharePoint 2013 farm is deleted. This was kind of important for them because the power to create and delete site collections is delegated to project owners, team leaders etc. The customer often receives a requests for restoring a site that was deleted by mistake or they suddenly notice that a site with important information just disappears(deleted by the owner). The fastest way to restore such deleted site is to use the command Restore-SPDeletedSite, but often the request for restore comes after 30 days and the sites are permanently deleted. And since the key point in this script is the retrieval of SPDeletedSite I would like to explain a bit more for this feature and and share the history of it. I guess that every SharePoint administrator knows about this feature in SharePoint 2013 and a big part of us are so happy that we have it. 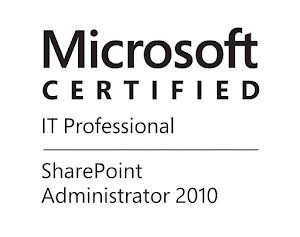 The story of it starts with the release of the SharePoint 2010 with a capability called "Gradual Site Delete". This capability was designed in order to mitigate performance degradation or even service interruption caused by so called Lock-escalation that may happen in the content database if we attempt to delete very large site collection. This was an issue in WSS 3.0 and Microsoft SharePoint Server 2007(MOSS 2007). The short story around "Gradual Site Delete" is that when a user deletes site collection, the site collection is not instantly deleted, it is marked for deletion and the content becomes unavailable. Then for the actual deletion is responsible a timer job definition called "Gradual Site Delete" that is executed on daily schedule by default(configurable). This timer job deletes the site collection from the content database in small enough portions to prevent lock escalation. If you want to read more on the subject, please check the post from Bill Baer. Then with SharePoint 2010 SP1 we received 3 additional cmdlets that are allowing us to work with site collections that are "marked" for deletion, but not deleted yet. They are the same as in SharePoint 2013 - Get-SPDeletedSite, Restore-SPDeletedSite, Remove-SPDeletedSite and Move-SPDeletedSite (Only in SharePoint 2013). And now with the cmdlet Restore-SPDeletedSite we can restore site collection that was deleted by the end user. As I said eventually this 'deleted' sites should be permanently deleted by the "Gradual Site Delete" timer job. The exact time how many days the site collection should be kept in "Gradual Site Delete" phase as SPDeletedSite object (marked for deletion) before permanent deletion, depends on the time settings of your site collection recycle bin that is set on Web Application level. By default the Recycle Bin is enabled and the retention period for the deleted items is 30 days. This means that if a site collection is deleted it will stay as "restorable" SPDeletedSite object for 30 days. Be aware that when you delete site collection in powershell with the command Remove-SPSite, you need additionally to specify parameter -GradualDelete in order to use the Gradual Site Delete. If this parameter is not used the site collection will be instantly deleted, it is strongly recommended to use Gradual Site Delete for large site collections.